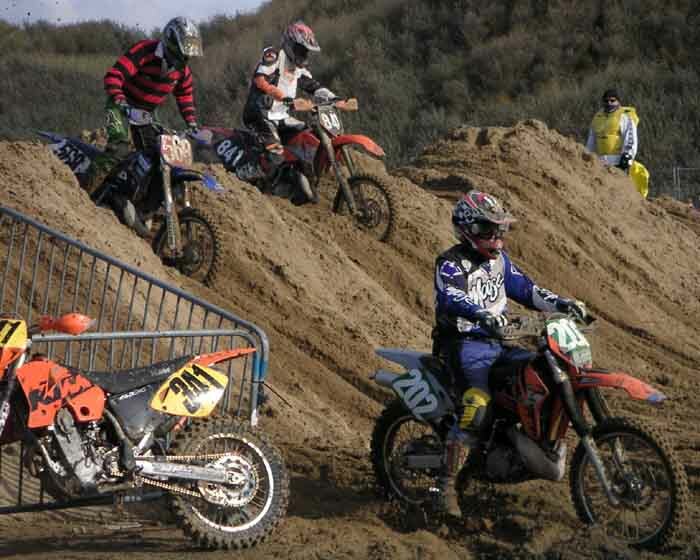 Last year (2002) I thought I would have a go at Weston Beach Race. I put in some extra gym time, stayed off the beer, and then on the day, the wind forced the event to be postponed for a week! I made an effort to keep up the training, and started the event the following weekend, only to dislocate my shoulder on the first lap. Not a great success. This year, I decided to have another go on my KTM 200, and even persuaded Ian Beard (KTM 300) to enter as well (the fool!). Not to be outdone, Paul Waycott (KTM 520) also entered. Teresa decided she would like a couple of days by the seaside, so we booked the caravan into the "Country Park" site at Sand Bay, just around the headland north of Weston. I dumped the caravan, 'T' and 'Scooter' the dog on the site on the Wednesday and returned home to prepare the KTM on Thursday. On Thursday evening I returned to Sand Bay with mine and Ian's KTMs. Ian and Daphne joined us a bit later, and we visited a couple of the local pubs to do some of our normal training. Friday morning saw us up early to get down to Weston for scrutineering before the queues got too big. No problems here and after a couple of hours we had the rest of the day to ourselves. I did actually have a little errand at lunchtime; to collect my mother from Chepstow on the Heathrow express as she had just returned from a little trip to Nepal! So that took our minds off the impending mayhem of the race. Friday night saw the arrival of my pit crew and training team from Dunstable. These guys are regular road racers, Manx GP, Northwest etc., but like to come down to watch the off-road riders, or 'puddle-jumpers' in action! The team quickly got us back to the pub for more training where we made a valiant effort to get as many Guinness hats from an ongoing promotion as possible. Training continued back at the caravan, but at 2am I had to tell them to 'go-away' as I was now 'fully-fit' (Different words I think - this is a family web site after all!). A less than sprightly crew emerged in the morning, but following breakfast supplied by 'T' the team cook, we headed along the old toll road (70p return in the van) around the headland to Weston for the Sidecar and Quad race. The weather was great and the race was highly entertaining. Certainly put us in the mood to do some more training in the nearest pub! By early evening thoughts turned to food. We tried the 'Old Colonial' but were told there was a 1.5 hr wait! Sod that! I rang Mr. Beard who was in the 'Cabot bars' where there was a 15 minute wait so we legged it down there. Beer followed food as it does, and 'Noisy' Neil Davis and Sonia turned up from Gloucester for an excellent social evening and some more serious training! It was a bit nippy and windy in the morning, but dry which was the main thing. We set up the refuelling and then got in the queue to retrieve our bikes from the Park Ferme. All the bikes and riders moved down to the beach a good hour before the start which I thought a bit odd, many riders went in their pits, other charged around on the beach behind the start. Then the start was postponed for half an hour because of the queues getting into Weston, but at 12:30 we were off! The start is the most amazing experience, 960 bikes charging up the beach at full chat - well most of them anyway. Poor old Paul forgot to turn his petrol on and was left on the line! There was the inevitable queue at the first dune but after a few minutes the barriers at the sides were opened up. In fact, I don't think I rode over any of the first half dozen dunes on the first lap! Riders soon started to spread out, so it was possible to get into a good rhythm. Mine was a fairly steady rhythm after last years shoulder popping. (That was the third time it had come out so I have to be a bit careful). One hour and 3 laps later I came in for fuel. The biggest problem was a mouth full of sand! The rest of the event was good and steady, 4 more laps, fuel, and then another 4 for a total of 11 laps. It certainly pays to go a bit steady and stay on the bike. I got stuck a couple of times early on, and found that the amount of energy required to pick up the bike was ten times what you would use to pull the bike out of an average Welsh bog! The mile long straight is no time to rest either. After hundreds of bikes have charged up it, it is covered in criss-crossing tracks which make high speed handling an interesting experience. Ian reckoned he had 100mph showing on his 300 which is a bit scary on something which is trying to chuck you off! Around the bend at the top of the straight was very soft deep sand at the base of the dunes, which caught out loads of riders who were still going too fast, especially near the end of the event when people were getting very knackered. The rest of the course was surprisingly rideable, but 100% concentration was definitely required at all times. What of the others? Paul got fired up after his slow start and also managed 11 laps, but Ian had a bit of a prang on lap 3 and had to retire with a hurt thumb. The next day he had it checked out at casualty and discovered some broken bones so he now has his arm in a cast! Overall then, a thoroughly enjoyable event (for me anyway! ), and an excellent social weekend. There were 57,000 spectators who saw 960 starters, of which 530 finished the three hours. I was in position 336, and Paul 346 which are respectable results. If anyone thinks they can do better, I'll see you next year!!! Thanks to all who helped out, the Dunstable pit crew and 'T' for feeding us and chauffeuring us to and from our 'training' venues!